and positive lyricist. “Be Real.” “Be Righteous.” “Be Relevant.”—are the three key tenets behind Dee-1’s 3’S Up EP title. Featuring stand out singles “Against Us” and “I’m Not Perfect”, 3’S UP will be available everywhere digital music is sold. Dee-1, a former middle-school teacher, first began making noise on the music scene several years ago. Since releasing his first studio project David & Goliath in 2009, he’s earned international attention and acclaim from his passionate messages and his energetic live performances. 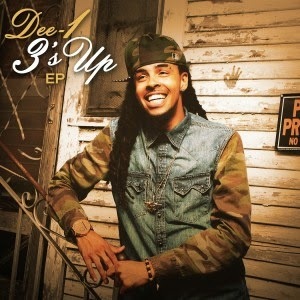 Dee-1 signed with RCA Inspiration in 2013 and has continued to gain fans all over the world, as well as respect from his peers, politicians, college professors and teens. A 2014 BET Music Matters artist, Dee-1 has toured with the likes of Macklemore, Lupe Fiasco and Lecrae and made his debut on the BET Hip Hop Awards last fall. Although Dee-1 has already accomplished a lot, he knows he’s at an important place in his career and there’s much more for him to conquer. When talking about 3’S UP and what he wants to accomplish with this project, he says “I have never been interested in just making music. I make music that inspires and motivates my listeners to find and fulfill their God given mission. As long as I accomplish that with the 3’S UP EP, I’m cool.” Dee-1 hopes that 3’S UP will provoke thought and continue to expand hip-hop’s horizon.